LAP LAMBERT Academic Publishing, 2012. Within the emerging interdisciplinary scope of landscape theory, and taking as its object of study the work written for the stage by contemporary British playwright Harold Pinter, this book is the first sustained in-depth study that relates Pinter’s dramatic images and sensory landscapes to Symbolist theatre and theory, so as to disclose several unexplored ecocritical and micropolitical resonances of his theatre for our times. 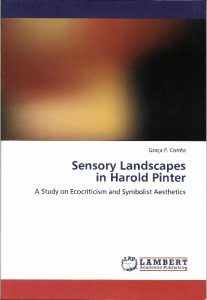 Ecocritically, Pinter’s landscapes evoke a sense of warning against the end of “nature,” or against the ending of vital connections between human and extra-human realities. Micropolitically, his sensory images expose a concern with the ethical dimension of individuals, and with the ecology of their relationships within a commonly shared space. Methodologically, this transdisciplinary study argues for a phenomenological experience of playtexts, and for a reading of their landscapes not just in terms of their actual spatial and sensory features, but also by examining their aesthetic interactions with other authors’ drama, fiction, philosophy, poetry, and paintings.